Will The WWE's Loss Be The Indies Gain? What's Left For Triple H in Wrestling? When AJ Styles was rumored to sign with WWE, a lot of us were skeptical. I mean the past had shown us that former TNA stars who come to WWE don't necessarily get the right love from the company. We suspected that Styles would end up in NXT, fighting against a ton of great stars who he was familiar with like Samoa Joe and possibly James Storm (who was appearing on NXT at the time). There was hope that maybe AJ wouldn't have to change his name or spend a year or two in NXT and get a fair shot on the main roster. When AJ debuted in WWE, it was at the Royal Rumble and it was an amazing debut honestly. Styles would be welcomed very well into the WWE system, as he would come into the Royal Rumble match and last for over 20 minutes before getting eliminated by Kevin Owens. There was talk of Styles and Owens going into a feud right away, and from there, the fans were excited. We thought maybe Styles would get into the US Championship picture or possibly the IC Championship picture. He has all the tools, he is a great performer, so at least he could get a secondary title shot and mid card feuds, right? Well, when AJ came in, after we saw that he wasn't going to NXT, there was still a bit of skepticism about what his first feud would be. What better way to start your WWE career than with a feud against the legendary Chris Jericho? Well, that's exactly what happened, as a series of matches took place between the two wrestlers, seemingly getting better with each contest. AJ would get the first victory, Jericho would get a return victory, and at FastLane, AJ would get a big win seemingly ending the feud. Oddly enough, Jericho and Styles would continue their feud, but it would be used as a means to turn Jericho heel. Jericho vs Styles continued to Wrestlemania 32 where Styles ended up taking a loss unfortunately, as Jericho would end up as a heel. However, AJ would turn the negative to a positive and win a No. 1 Contender match to get a shot at Roman Reigns and the WWE Title. This seemed to be a huge step in the right direction. As Styles and Reigns prepared for their clash, Styles was joined by two of his former buddies from New Japan, Luke Gallows and Karl Anderson. WWE wisely put the three together instantly and the rest is history. Their chemistry still translates well in WWE and this remains surreal to watch every time. 3 months in, a title shot, and an impending PPV main event? Had AJ Styles exceeded expectations? Hell yes, he had. To make things even better, Styles having Luke Gallows and Karl Anderson by his side somehow gave WWE TV an indie feel as well. It would be something that fans only could have dreamed of just a year ago. Reigns and Styles had a great match at Payback and Styles gets a rematch at Extreme Rules. When AJ arrived, we were worried about him maintaining his name and just getting a fair shot. Now, he's the no. 1 Contender, comfortably in a main event spot, and will be a big player for many months to come. The possibility of a Shield vs The Club battle or even a Seth Rollins vs AJ Styles main event feud just proves that AJ Styles is here to stay. 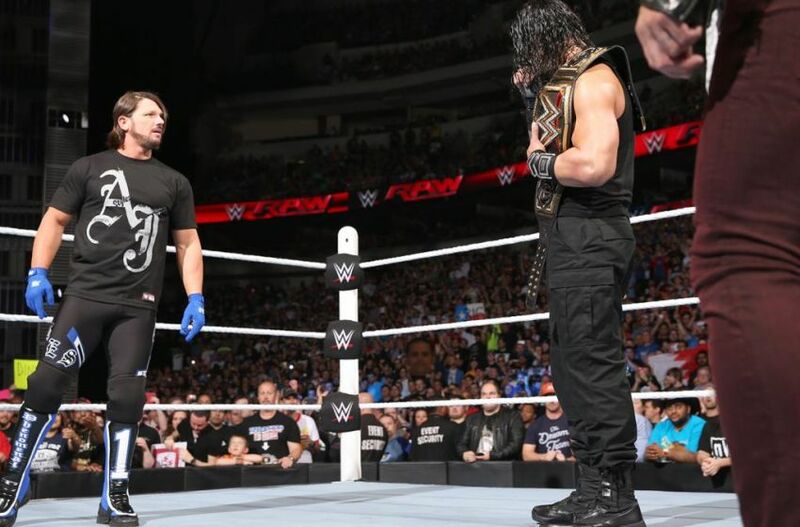 What could be next for AJ in the WWE after this Reigns feud? Could he actually shock the world and win the title? Or will he end up in the IC Title picture feuding with the likes of Cesaro and Sami Zayn? That would be great as well, but what about a upper mid card feud with Kevin Owens? 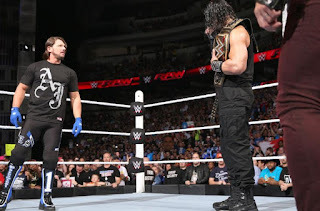 How about Styles vs Ambrose? Or how about Finn Balor vs AJ Styles? Or Finn Balor coming up to the main roster to join The Club? There's a huge possibility that Styles vs Orton could happen when Randy returns from injury, as well as Styles vs Cena and all of those matches actually make sense. Months ago, when we were just hoping he doesn't end up as a WWE Superstars/Zack Ryder type, we wouldn't have envisioned that AJ would be so in the driver's seat in WWE. It's a breath of fresh air to see one of the best in ring performers getting his just due. 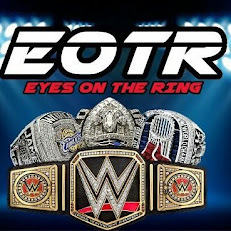 I just hope WWE surprises us and pulls the trigger on AJ getting a shocking title win at Extreme Rules. Here's to AJ, his WWE Title hopes, and the future. Congrats on exceeding expectations and showing the world what most of us already knew.